This coin, an early product from one of Spanish America’s first mints, testifies to the ways that imperial needs shaped local economies. Two sides of a single coin are shown in this photograph, with reverse at left and obverse at right. On the obverse, the pillars of Hercules, identified with the Straights of Gibraltar, are encircled with the words “Hispanum et Indiarum”—Spain and the Indies—as the New World was called. The figure “4” between the pillars is the coin’s denomination: 4 reales. 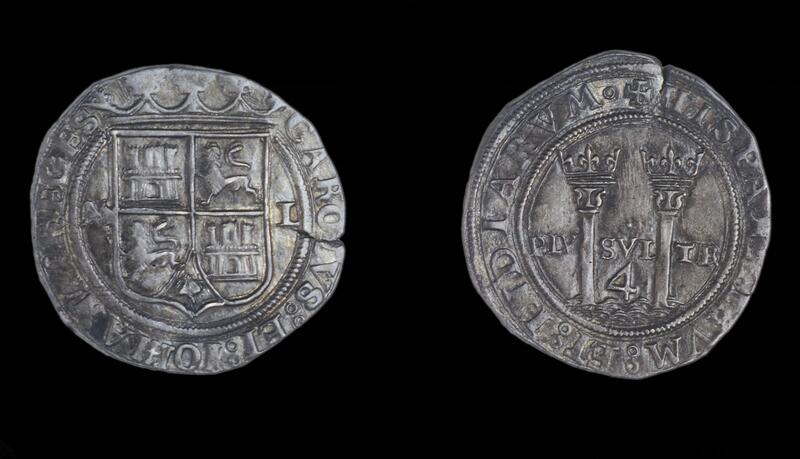 On the reverse, the coin shows the emblem of Castile and Leon (a shield with two castles and two lions), the kingdoms within Spain that claimed the Americas as theirs. The mintmark, a large “M,” set to the left of the shield identifies the coin as being made in Mexico City’s mint, which the crown ordered to be founded in 1535. As is typical, this coin registers the names of reining monarchs. In the border around the shield, the Queen Mother Juana ("Iohana") and her son Charles ("Carolus") are named. Each mint had a distinctive set of initials to mark coins. This coin is known to have come from Mexico City because of the “M” marked on one side. The other initial, the “L” identifies the assayer, the royal official in charge of overseeing the purity of the mint’s products. At the Mexico City mint, silver that had been smelted in the mines to the north was worked into sheets and then cut into rough discs of a precise weight. Smiths hammered the heated discs on dies to mark the money. Since the dies lacked edges, each coin had an irregular edge; this coin measures 1.3 inches (3.3 cm) and is slightly smaller and thinner than an eight real coin. Only in the 18th-century, with introduction of milled coinage made on machines, did Spanish American coins take on an even appearance. Coins like this one are rare because through time, they were melted down and recast into new coins or silver objects. 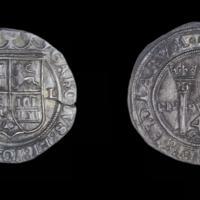 Some of the coins from Spanish America known today were salvaged from shipwrecks. This coin comes from one of the largest collections of Spanish American coins, collected by a New Yorker, Archer B. Huntington, who founded the American Numismatic Society. In Mexico City, cacao beans were the favored currency of indigenous people, and continued to be used even after Spanish colonists introduced silver currency. But the durability and elite preference for silver coins led to them becoming a dominant currency in the New World. González Gutiérrez, Pilar. 1997. Creación de casas de moneda en Nueva España. Alcalá de Henares: Universidad de Alcalá. Rojas, José Luis de. 1998. La moneda indígena y sus usos en la Nueva España en el siglo XVI. Mexico City: CIESAS. Vilches, Elvira. 2015. "Trade, Silver and Print Culture in the Colonial Americas." Journal of Latin American Cultural Studies 24 (3): 315-334.